Rich in flavour, this Sri Lankan curry is great on its own or served with brown rice. 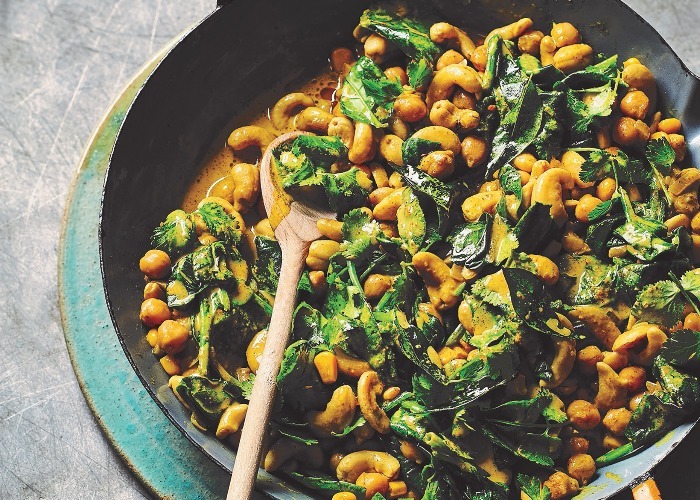 It's got a creamy, coconutty base with cashews, sweetcorn and spinach. Tip: green radish leaves, chard or other leafy greens work well instead of spinach. Melt the coconut oil in a large saucepan over a medium heat, then add the ginger, garlic, bay leaf, shallot, curry leaves and lemongrass (if using), and sauté for 2–3 minutes until softened and lightly coloured. Add the curry powder and drained cashews, along with a pinch each of salt and pepper, and cook, stirring, for 2–3 minutes. Add the sweetcom and spinach, re-cover and cook for a further 2–3 minutes to gently cook the greens.